Per his military service record (regimental no. 4866), Joseph Parrish was born at Monmouthshire, Wales. He gave his age as 18 years and 5 months, his marital status as single, and his occupation as miner. His description on his medical was height 5 feet 4 inches tall, weight 118 lbs., with a fair complexion, black eyes, and black hair. His religious denomination was Methodist. He claimed that he had no previous military service. He joined the Coo-ees at Wellington. He completed his medical on the 16h October 1915 at Wellington, and was attested by Captain Nicholas at Orange on the 24th October 1915. A note “Presented consent at Orange 24/10/1915” is written at the top of his attestation paper. On his embarkation roll his address at time of enrolment was Boolaroo, via Newcastle, N.S.W., and his next of kin is listed as father, J. Parish, Boolaroo, via Newcastle, N.S.W. On 8th March 1916 Private Parrish along with many of the other Coo-ees departed Sydney on the HMAT A15 Star of England, and arrived in Egypt on the 11th April 1916. On the 16th April 1916 Private Parrish was transferred to the 4th Pioneer Battalion at Tel-el-Kebir. On the 4th June 1916 Private Parrish left Alexandria aboard the Transport Scotian bound for France, arriving at Marseilles on the 11th June 1916. Private Parrish served with the 4th Pioneer Battalion until the 10th of August 1917 when the Battalion was conducting night works on communication trenches in the vicinity of Kemmel, Belgium. Private Parrish was evacuated from the field sick, and on the 12th August he was admitted to the 13th Australian Field Ambulance, then sent to the 4th Division Rest Station. He was discharged on the 22nd August 1917, and rejoined his Battalion on the 28th August 1917 whilst it was resting at Neuve Eglise, France. On the 17th October 1917 the 4th Pioneer Battalion was conducting road works on the Zonnebeke Road. On this day Private Parrish was charged with ‘conduct to the prejudice of good order & military discipline, in that he after being placed on a task in the forward area quitted same without authority’. He was awarded 14 days Field Punishment Number 2 and fined 14 days forfeiture of pay. On the 12th May 1918 Private Parrish was transferred to the 4th Machine Gun Battalion. On the 10th June 1918 the 4th Machine Gun Battalion was in action in the vicinity of Villers Bretonneux when Private Parrish received a gun shot wound to his neck. He was admitted to the 4th Australian Field Ambulance. He was moved to the 61st Casualty Clearing Station later that day. On the 11th June 1918 he was placed on the Number 17 Ambulance Train for evacuation to the 53rd General Hospital at Boulogne. He was admitted to the 53rd General Hospital on the 12th June 1918 where he was also diagnosed with Broncho Pneumonia. On the 27th June 1918 Private Parrish died of his wounds. He is buried in the Terlincthun British Cemetery, France. Private Parrish’s name is commemorated on panel 176 on the Australian War Memorial First World War Roll of Honour. His name is also listed on the Boolaroo District Roll of Honour. 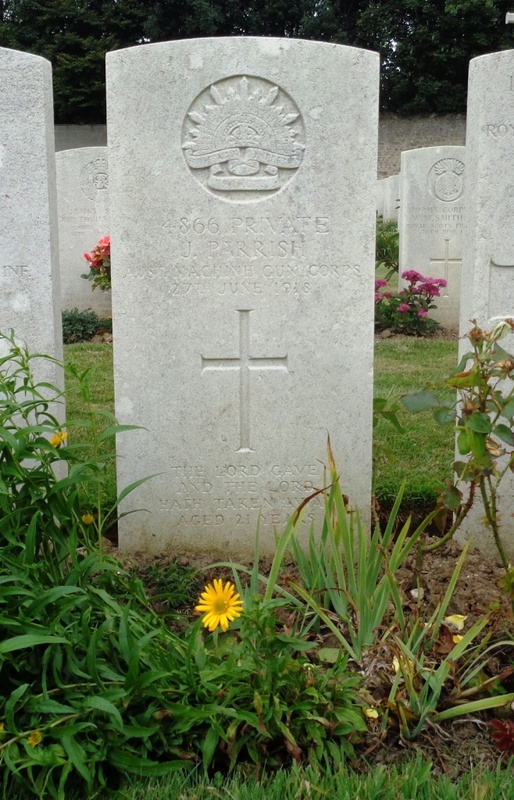 This entry was posted in Recruits, Roll of honour and tagged Joseph Parrish, Orange recruits, Terlincthun British Cemetery, Wellington recruits. Bookmark the permalink.